The Cohousing Research Network (CRN) will host a forum for scholars, researchers, writers and anyone in research and writing that focuses on cohousing. There will be an organizational session to build the structure of CRN and work on its website. There will be a session to present findings from the 2013 Survey. There will be a session to present recently completed research and work in progress. And there will be opportunities to identify additional research needs, to make connections with like-minded colleagues, to brainstorm and explore future avenues of research and writing, and opportunities for collaboration and possible sources of funding. This forum will contribute to the development of a body of documentation which will support efforts to better understand cohousing through comparison with other communities, and populations and through periodic national surveys. 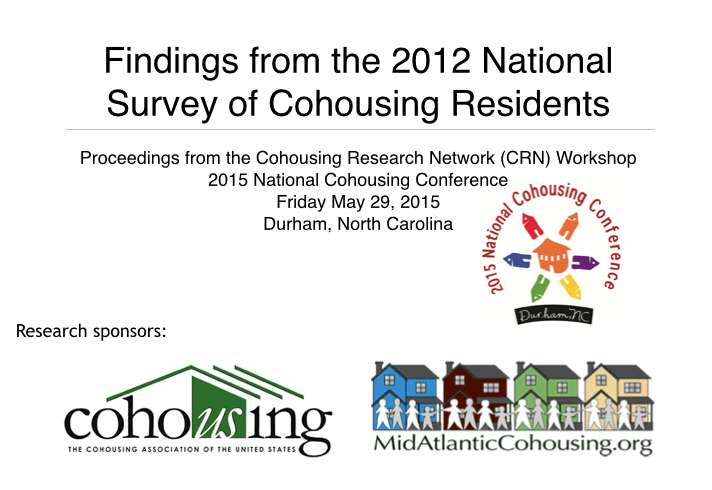 For more information, contact Diane Margolis Director of the Cohousing Research Network. Diane Margolis is a founding member of Cambridge Cohousing. She was a member and facilitator of its Community Life Committee for about a decade. She was a member of the Board of Directors of Coho/US and chaired its research committee. She is currently the Director of the Cohousing Researchers Network (CRN). She is the coauthor with David Entin of the Report on the Survey of Cohousing Communities, 2011 and is currently working with other members of CRN on presentations and publications from the 2013 Survey of Cohousers. Diane received her PhD and MA in sociology from NYU after attending Cornell University for her undergraduate work. She is Professor Emerita of Sociology at the University of Connecticut. She has published two books, The Fabric of Self (1998, Yale) which won Honorable Mention at the First Annual Book Award of the Eastern Sociological Society; and The Managers (1979, Wm.Morrow) which was a Book of the Month Club alternate selection. Shorter works include academic papers published in sociology journals including: Social Problems, Gender and Society, and the Humboldt Journal of Social Relations; chapters in several books; and papers presented at dozens of annual conferences including the American Sociological Society, the International Sociology Association, and the Eastern Sociology Society.